We can help our kids avoid obesity by cooking more meals at home, providing healthy snacks, and limiting screen time. In the United States, childhood obesity is a big concern—and it’s growing bigger. Children are at a greater risk of being obese than ever before. A recent study found that lack of exercise, fast food, and the number of hours spent watching television are all factors contributing to the epidemic. 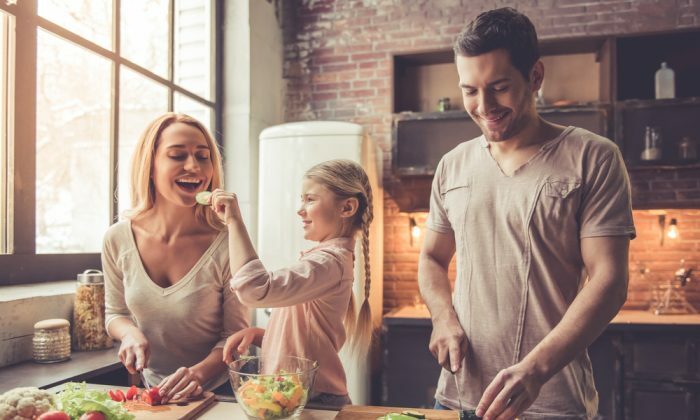 However, Dr. Joseph Galati, author of “Eating Yourself Sick: How to Stop Obesity, Fatty Liver, and Diabetes from Killing You and Your Family,” suggests another element is partially to blame: parental habits. The root problem, he tells Healthline, is that parents aren’t paying enough attention to what they feed their kids. Families aren’t eating enough home-cooked meals and parents aren’t serving healthy snacks. From ages 8 to 18, they also spend an average of 7.5 hours a day wrapped up in TV, computers, video games, cell phones, and movies. During those hours they tend to snack as well. Much evidence backs up Galati’s claim that childhood obesity can shorten a person’s life, upping their chances of heart disease, stroke, liver disease, and cancer. Research shows U.S. life expectancy at birth has actually dropped in the last two years. The problem is worse in areas of the South and Midwest where more people are obese, notes David Ludwig, an endocrinologist and obesity specialist at Boston Children’s Hospital. Up to 40 percent of obese children have nonalcoholic fatty liver disease (NALD), which can progress to cirrhosis of the liver. One group’s clinical guidelines recommend screening obese children for NALD between ages 9 and 11, and screening overweight children with prediabetes, a big belly, or sleep apnea. NALD seems linked to the size of your waistline as much as your overall weight. A mother’s responsibility for a child’s weight may begin as early as the womb, according to one large 2012 German study. Expectant mothers who gain too much weight during pregnancy increase their child’s chances of being overweight by 28 percent before they turn 6 years old. In a study of 4 year olds, findings showed that those who regularly ate dinner with their families—and also had limited screen-time and enough sleep—were 40 percent less likely to be obese. The American Academy of Pediatrics (AAP) advocates for “screen-free” zones in children’s bedrooms, no TV during dinner, and only one or two hours a day of watching TV or playing video games. Tapping fingers on a keyboard or jiggling a mouse doesn’t count as exercise. The Centers for Disease Control and Prevention suggests a target of doing at least an hour of physical activity a day, most of it aerobic, and muscle and bone-strengthening activities like skipping rope, gymnastics, and pushups at least three days a week. Stick to bedtimes and keep electronics away from the bed. Fatigue leads to overeating and can prime the body for weight gain. Overweight children may need treatment for sleep apnea as well. “When you do not sleep enough, your inflammatory markers go up, it raises blood pressure, insulin, and cortisol,” Galati says. Pont, who is the medical director of the Office of Science and Population Health for the Texas Department of State Health Services, urges doctors to avoid any kind of fat-shaming. A number of studies have documented “anti-fat bias” among medical professionals. A team at Johns Hopkins did a national survey of 600 higher-than-normal weight adults to test that thesis. The result: If your primary care doctor had talked to you about your weight and you felt judged, you were more likely to try to lose weight, but less likely to actually succeed. About 13.5 percent of those who felt judged in that conversation went on to lose at least 10 percent of their weight. But among those who didn’t feel judged, a bigger group—more than 20 percent—reached that goal. Temma Ehrenfeld is a journalist who covers health, psychology, and personal finance. This article was originally published on Healthline.